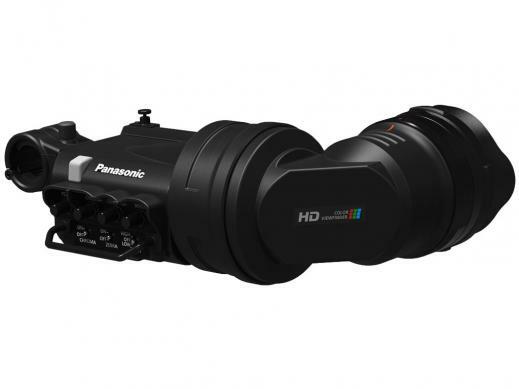 The AJ-CVF50G 1,5-type HD viewfinder supports the P2 HD series and Studio Cameras. It is equipped with a 1,5-type display which is suitable for a viewfinder. It adopts a new device capable of continuous image display without causing burn-in, which enables users to see the entire picture on the viewfinder at all times, even with their eyes at a distance from the viewfinder. Among the various functions of the CVF50 developed for smooth recording are the quick response suitable for recording sport events and one-touch switching of monochrome and colour mode. The use of a large 1,5-type device means lower magnification on the eyepiece. Users can easily see images at any position of their eyes without causing unintended magnification, making it easy to view the entire picture at all times. There is no need to open and close the lens barrel or move the visual point between the LCD and viewfinder. The newly equipped device does not have burn-in for lifetime. Since images can be displayed continuously, users are able to check the video image through the viewfinder at all times. The display achieves high-speed response as fast as CRT and OLED, which is suitable for recording sports events where fast moving subjects need to be captured. Users can switch between monochrome and colour mode with a single touch of the front button. The use of a large 1,5-type display means lower magnification on the eyepiece. Users can easily see images at any position of their eyes without causing unintended magnification, making it easy to view the entire picture at all times. There is no need to open and close the lens barrel or move the visual point between the LCD and viewfinder.